The release rights for Korean musical comedy Highway Star has been sold to Japanese firm Avex Entertainment. For Avex, known primarily as one of the largest independent record labels in the world, the pick-up marks its first purchase of a Korean film after a recent move into the film industry. 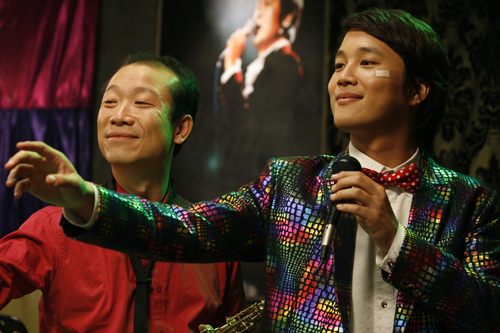 Korean sales outfit Studio 2.0 sold the film, which stars My Sassy Girl lead actor CHA Tae-hyun. Highway Star is about a struggling rock musician who is duped into 'trot' music, a now often mocked traditional style of Korean country music popular in the 80's and still loved today by the senior generation. The film is a remake of a Japanese feature titled Enka no Hanamichi. Its grossed US$11.7 million on its release at home in February, following in the footsteps of other Korean music-themed comedy-dramas of personal transformation such as Radio Star (2006) and the mega-hit 200 Pounds Beauty (2006). The film is the feature debut for directors Kim Hyun-soo and Kim Sang-chan.